There have been rumours of infidelity on both sides following Amber Rose and Wiz Khalifa's sudden split. But the model took the time to insist to her fans that she stayed faithful to her husband before filing for divorce from him on Tuesday. 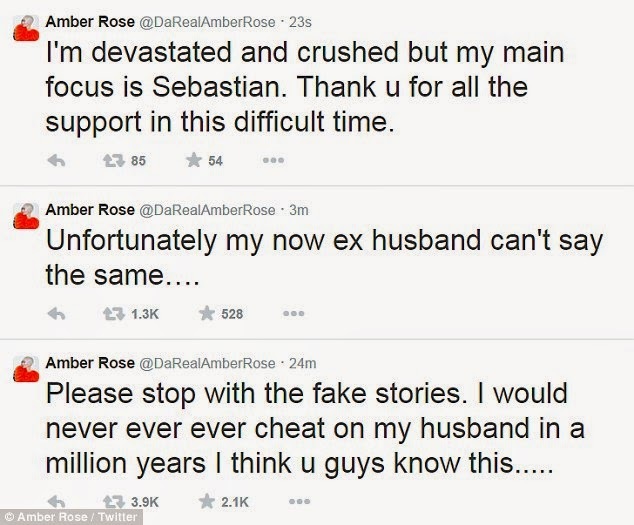 However in clear proof the break-up has turned bitter, Amber then went on to accuse the rapper of cheating on her. 'Please stop with the fake stories. I would never ever ever cheat on my husband in a million years I think u guys know this,' she tweeted. Wiz, 27, is not yet the 30-year-old's ex-husband as the former couple are only just starting divorce proceedings. MailOnline was unable to contact Amber's representative for comment and a rep for Wiz did not immediately respond when contacted. The pair were married for one year before Amber suddenly filed documents in a Los Angeles court earlier this week. Although it seems that things are getting nasty between the two stars, Amber went on to say she wants to put the pair's 19-month old son first. Divorce papers reveal that Amber is asking for full legal and physical custody of Sebastian, allowing Wiz visitation rights. 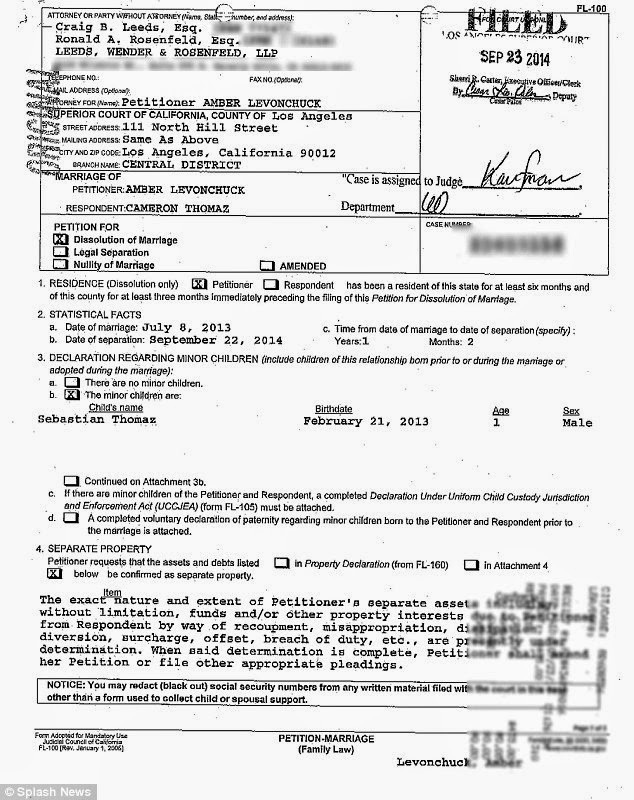 The couple had a prenup, which provides spousal support. 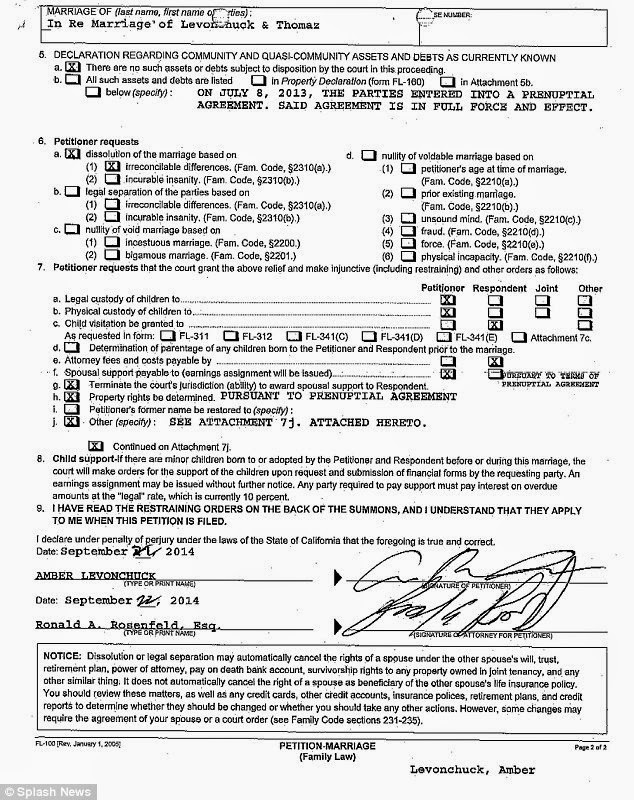 Their date of separation is listed as September 22, the day before the filing. According to TMZ, both stars believe the other to have cheated, and the website reports that Amber grew suspicious of Wiz when he would not let her join him on tour in July. TMZ claims the musician told his wife to stay home with the baby, while he went out and made money. Meanwhile, the website reports Wiz is accusing Amber of being unfaithful with her new manager Nick Cannon, who she has allegedly been spending time with since his split from wife Mariah Carey. Nick denies having anything to do with the break-up, sources told TMZ.